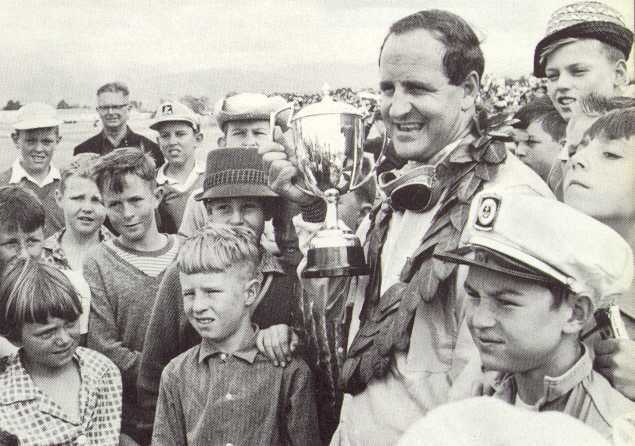 Almost unknown in his own country, but regarded as one of the best Formula Junior racing motorists in Europe, Denny Hulme, of Te Puke, proved himself more than a match for New Zealand's leading international driver, Bruce McLaren, and the young American, Timmy Mayer, by winning the Vic Hudson Memorial race, the 5th Levin International, opening round of the 1964 International Tasman Series, at Levin. Driving a 1963 2.5-litre Brabham-Climax, Hulme won his preliminary heat and set a new lap record of 50.3 sec. In the twenty eight lap final (30.8 miles) Hulme took over the lead after eight laps of the circuit and drew away from Mayer and McLaren. Mayer finished second narrowly from team-mate McLaren and next in line were Tasmanian John Youl (2.5 Cooper-Climax) and local drivers Tony Shelly (2.5 Lotus-Climax) and Jim Palmer (2.5 Cooper-Climax). Of the fourteen starters these were the only ones to go the whole distance. Hulme's race-winning time of 24 min 36.8 sec constituted a new record, the previous one of 24 min 50.6 sec having been established in 1963 by Jack Brabham. In that year Brabham had also set the former lap record of 51.8 sec. The Tasman Formula Cooper-Climaxes of Bruce McLaren Motor Racing Ltd and the larger Brabham-Climax of Hulme were the centres of interest in the paddock on practice day. A notable absentee was the 1963 Levin winner, Jack Brabham, who had decided to race only at Pukekohe and Wigram. Nevertheless, Hulme kept the flag flying by recording fastest qualifying time, 50.7 sec. McLaren and Mayer managed 51.4 sec and 51.7 sec on the rather bumpy 1.1-mile circuit. Young Chris Amon (2.5 Lola-Climax) with 52.2 sec and Shelly, who took his Lotus round in 52.3 sec, were next, while Palmer, who had to hold the Cooper's gear lever in third ratio, managed 54 sec. There were 14,000 people on hand to see the first heat of the feature race. 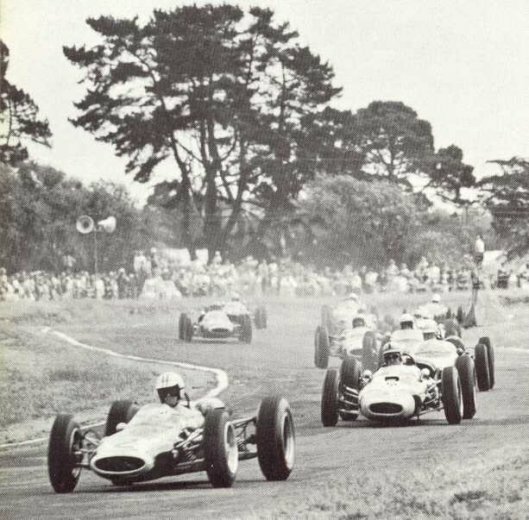 This field comprised all the Formula Junior type cars and a pair of rather antiquated single-cam Cooper-Climaxes, and the eight-lap race developed into a grimly contested battle between Andy Buchanan (1.6 Brabham-Ford), Roly Levis (1.65 Lotus-Ford) and Rex Flowers (1.5 Lotus-Ford). They were never more than six lengths apart from start to finish and, to add interest, former speedway star Bruce Abernethy, in the first of the old Cooper-Climaxes, made hacks of the rest of the field. In the excitement the contestants were by some mischance allowed to complete an additional lap, but when the corrected times were posted Buchanan had won in 7 min 25.5 sec by 0.4 sec from Flowers who, in turn, was only 0.2 sec ahead of Levis. Hulme had pole position in the second heat, with McLaren, Mayer and Amon outside him. Hulme and Mayer were first out, but McLaren moved in quickly and first time round narrowly led Hulme, who was followed by Mayer, Palmer, Youl, Amon and Shelly. A couple of laps later Youl took Palmer, but the other positions remained the same until the sixth lap when Hulme, who had been looming large in McLaren's mirrors, took the lead on the tricky back leg of the circuit. 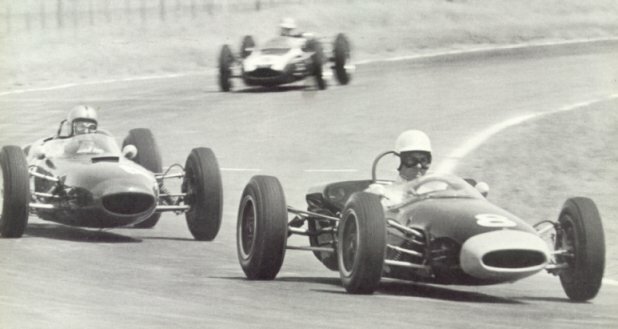 In the course of this lap both drivers bettered Brabham's 1963 lap record, but Hulme took the honours with 50.3 sec and went on to win the race in 6 min 55.8 sec from McLaren and Mayer, who were both given 6 min 58.8 sec. Youl, Amon, Palmer and Shelly were next in line. In the final Hulme again had pole position and shared the front row with Mayer, McLaren and Youl, while Amon, Shelly and Palmer were in the second row. When the flag fell on the fourteen starters Hulme and Mayer made a drag race of it to the sweeping left-hand loop, the American leading by a short nose. McLaren and Youl were a little slow and for the first two laps there was barely daylight between the leaders, with McLaren some two lengths back, then Shelly, Palmer and Youl, and Amon heading the next group of Flowers, Buchanan and Levis. After five laps, 5 sec separated Mayer from his team-mate McLaren, and Hulme was in between them. Other major placings were unchanged, but Buchanan made a long pit stop while the leaders hared away from McLaren to increase the margin to 15 sec by the time eight laps had been completed. Hulme now decided to hit the front and passed Mayer coming out of the hairpin as the American overdid things slightly. Four laps later Hulme had opened up a 7 sec lead over Mayer, who was really trying, while McLaren sat back and watched the fireworks from a comfortable third place. By now the leading trio had lapped the tail-enders and 8 sec separated Hulme and Mayer, while McLaren was 15 sec ahead of Youl, who had taken Shelly. Then came Palmer, Amon, Levis and Flowers. A lap later Amon abandoned the race and placings did not alter at the finish, a very calm Hulme coming home 25.5 sec ahead of Mayer, with McLaren 3.6 sec back, followed by Youl, Shelly, Palmer, Levis and Flowers. Fastest lap: Denny Hulme, 50.3 sec (in preliminary heat) (record).